Remember that scared, shy first grader we once had? Well, he's long gone. It took a few weeks, but we now have an excited, happy-to-go-to-school first grader. It's awesome. He's made friends, likes homework (I'm not kidding) and he loves his teacher. He tells us every day that she's the best. That's why we are all so bummed out to hear that she's pregnant! Due in January! Is that really allowed? We're happy for her, of course, but ... ugh. My co-worker friend is helping one of her friends with her wedding, and mentioned they are doing a candy bar. I think it is such a cute & great idea. 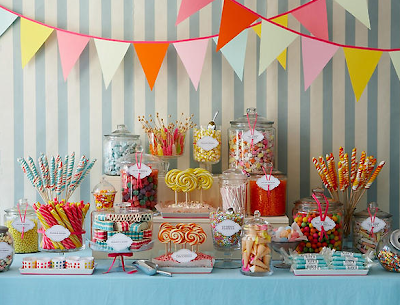 Then I happened across this photograph by Amy Atlas, who specializes in dessert tables. Isn't it amazing & yummy? 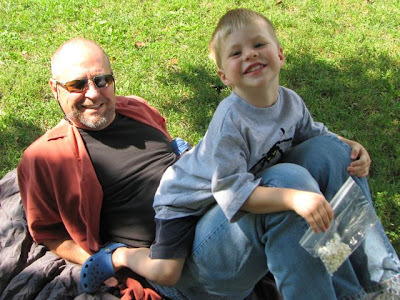 Brian's been gone since last Sunday -- way too long for our liking around here. 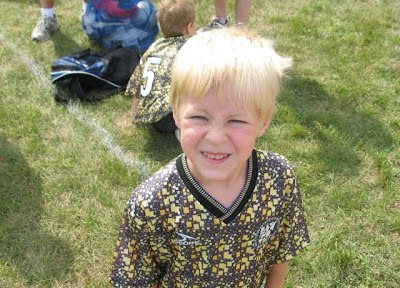 H had a early soccer game on Saturday (the undefeated Yellow Jackets won again, 3-0), so the boys and I thought it would be a great weekend to get away to Wisconsin. We haven't been up for a couple months, and it was really nice. 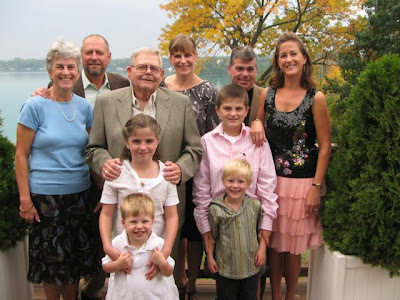 It also is Grandpa Bobby's 82nd birthday today, so he took us all out to dinner. Against his dismay, Christie, Tim and I had surf-and-turf -- it was really, really good. Thanks Grandpa! It was really nice spending time together. Wisconsin was absolutely beautiful right now, with the leaves starting to change colors and fall in the air. H, C and Storm went on a couple adventure walks with Nina & Papa which they love. We saw a couple deer. 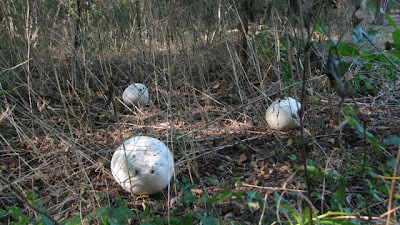 And also found these massive mushrooms. They were about 1-foot round, and I guess they are usually much larger. Brian's on his way back from Las Vegas, where he was at Interbike 08. I didn't get all the highlights, but besides seeing Blue Man Group and dancing until the wee morning hours, he also had some great dining experiences. Since he stayed at The Venetian, Bouchon is a morning ritual. He also went to Mario Batali's B&B Ristorante, Spago and Dos Caminos at The Palazzo. He left on Friday with our friend Scott, who was also at the trade show, and headed for Los Angeles/Manhattan Beach to visit some friends. We can't wait to have him home. 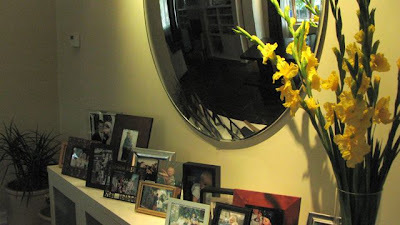 This is one area of our house that always seems to overflow. 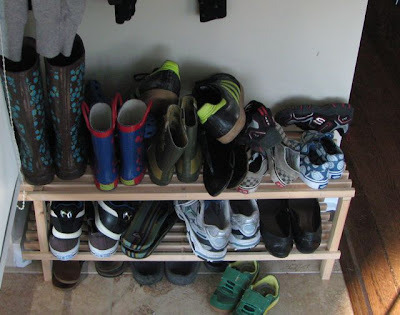 Looks like Brian's and the boy's shoes will need to find somewhere else to go! This has been a week filled of work, chasing around and school meetings. Not much time for anything else. So I've just been wandering through my house finding stuff I like and that just makes me happy (as you might tell from the last few posts). 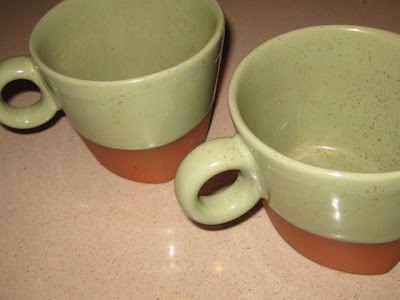 These amazing mugs were created by Eshelman Pottery, and found at an art fair in Racine. They were one of the first things Brian and I bought ourselves when we moved in together. I think we even purchased one each ... you know, just in case. Thankfully, that was fifteen years ago and the mugs remain a set. Without even knowing these particular mugs resided in our house, our friends John & Melissa Richards gave us a teapot and mugs made by this same guy when we got married -- I couldn't believe it, and I'll definitely have to post a photo of them another time, because they are beautiful. 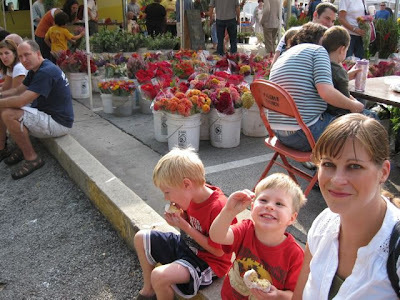 This week at the Farmer's Market, H got to pick out the flowers. He did good, I think. They each got to pick out a stem from the children's flower bucket too. Those are in their rooms. 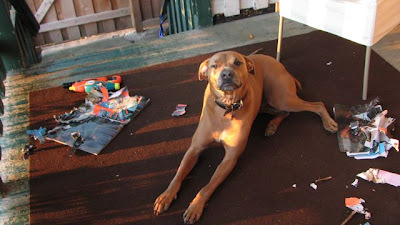 Storm is a 98% awesome, incredible, good dog. Perfect, besides the fact that he tends to jump up on people, doesn't realize he's actually 70 pounds not 7, and he eats plastic, paper, his dog bed and clothes fuzz like the world has run out of kibble and he's discovered a new doggy delicacy. At least it's not poop or people. I thought I was being nice by giving him a little extra outdoor time this morning. Forty-five minutes later, this is how I found him. 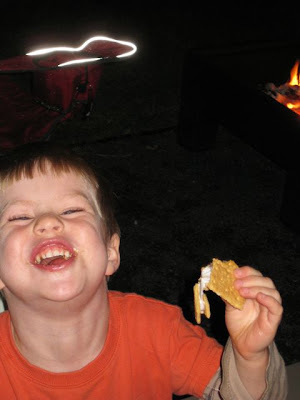 He even ate our marshmallow roasting stick. We invaded our neighboring block's block party (our house is the one on the corner, so it's really not that much of an invasion). 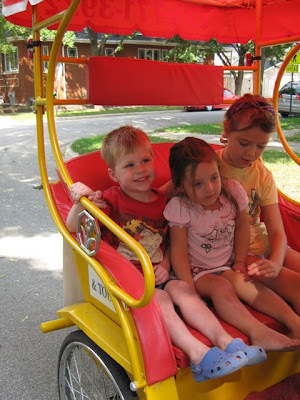 Our friends Chris & Penny organize it, and besides an awesome Spongebob jumpy thing, movies in the street at night, and train sets for the kids to build, they had a rickshaw. 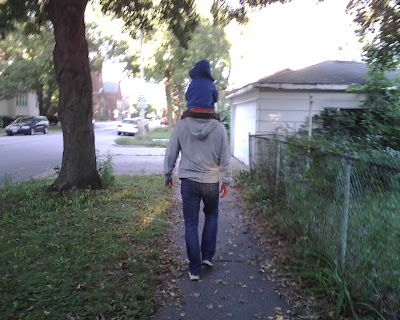 H was at his soccer game (they won, 3-2) during this time, but C got to take a spin around the block. We are enjoying the final few weeks of the farmer's market. 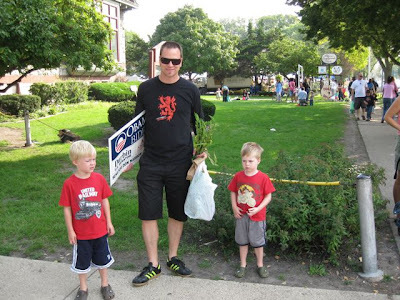 Some of the treasures we picked up were homemade donuts, organic beets, heirloom tomatoes, flowers and an Obama/Biden yard sign. 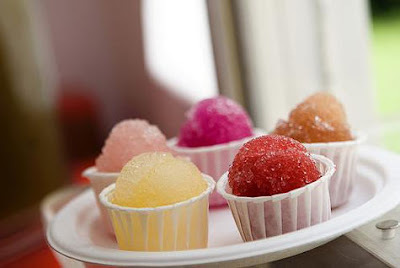 One of my major weaknesses are slushy drinks ... and snow cones. It's what I get whenever the ice cream truck pulls up. And I just can't resist a snow cone stand when I see it. It's really pretty pathetic. You can only imagine how I felt when I read this article on Design*Sponge. 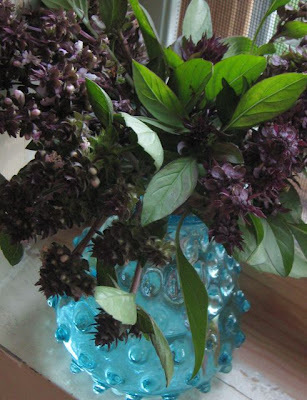 Oh my gosh ... Blackberry Lavender! Lemon Prickly Pear! Espresso Mexican Cane Sugar! All served out of an adorable spruced up 1957 Shasta Trailer. If I lived in a warm climate, this seriously could be my dream job. Owning a franchise of Fresher than Fresh. Ok, it didn't take much labor, but we did get fruit. 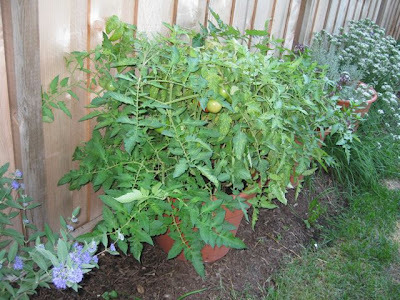 Honestly, I wasn't really sure how our tomato plants would do this year. I was late planting them (I even picked them up on clearance for $.25 for four). Plus, I'm awful at any sort of horticulture (note: overgrown basil and chives, and weeds) (indoor plants are a whole other story, and honestly have a slim chance of survival, but we try) so it's always kind of hit or miss. 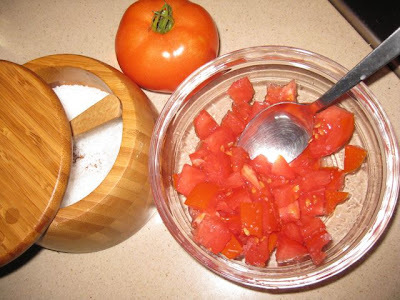 But finally, our tomatoes are ready. And our handy helpers, H & C, love checking every day to see if any more have ripened. Here's the first of our crop. And we were able to enjoy them last night with dinner. 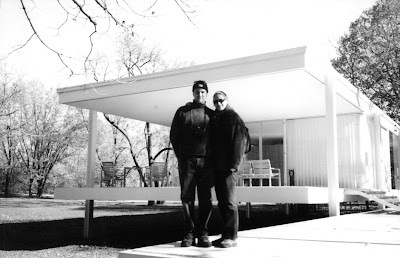 Right after Brian and I were married, we made our first visit to The Farnsworth House in Plano, Illinois -- a wonderful modernist masterpiece designed by Ludwig Mies van der Rohe. We love it there. 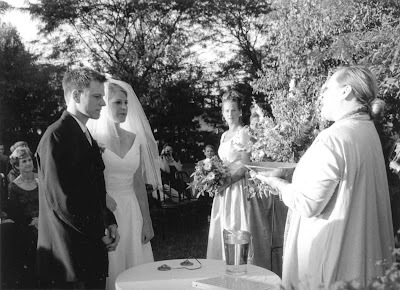 (I remember still feeling very newly-weddedly on our visit -- even though we were an item for six years before we actually tied the knot.) And since we haven't been back for years, and ownership has since changed (it was purchased from Lord Peter Palumbo in December 2003 by a group of local preservationists), we were just talking about making a pilgrimage there. 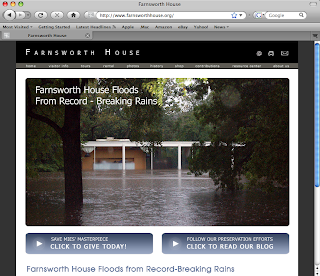 But the rain seemed to have hit the Farnsworth House too. It's not the first time this has happened, but it's really pretty devastating. It's a school night -- but a gorgeous school night. And we are really enjoying our outdoor area right now. Not hot. No bugs. It's perfect. Even the fact that our neighbor girl who just started playing the saxophone yesterday practices outside doesn't both me. 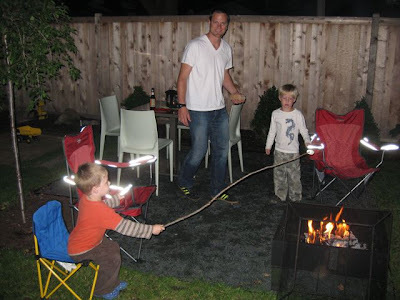 We ate dinner el fresco, and finished with a fire in our fire pit. And s'mores. We planned on doing that this weekend, but the record rainfall that hit the area kind of spoiled our plans. But not tonight! H & C had a blast at the birthday party. Here they are with some prizes from their goody bags. Brian and I had a great time too -- it meant two hours to explore. We went to Penzeys Spices where we picked up some mulling spices, peppercorns and a few other goodies. Next was the new Marion Street Cheese Market, where we had a Twig Farm's soft wheel goat/cow cheese (wow, delicious) and a Piave Vecchio. Finally ruined our dinner by getting some gelato at Paciugo. Brian had the vanilla lavender and Mediterranean sea salt caramel (my favorite), and I had triple chocolate and black pepper olive oil (really good -- like eggnog). As you can see, they had some really interesting flavors and their sorbets looked amazing too (lemon rosemary). It was a great two hours for all of us. The rain this weekend has been terrible. It's been non-stop since Friday, and we are feeling kind of trapped (I hope it's not going to be too long of a winter, especially since we are already feeling this way). After a few rounds of jumping on their beds and running through the house screaming, we had to do something to calm the mood down. 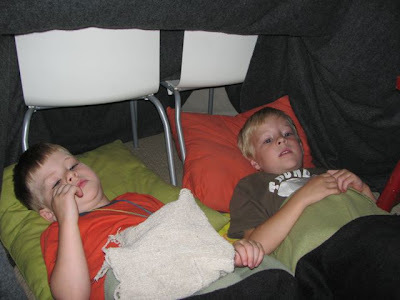 So, we made a fort, and H & C are watching a DVD. I give it another 5 minutes before chaos strikes again. Thankfully, the monsters -- I mean boys -- have a birthday party later today at My Gym, and will get to run around for a couple hours. Knowing H & C love (no, I mean, LOVE) trains, our friend Penny recommended a place she heard of called 2 Toots. It's been raining straight for two days. Soccer was cancelled. So we decided it was a good day to run around, and end at 2 Toots. (We'd be able to use the big surprise as a bribe along the way -- it worked.) 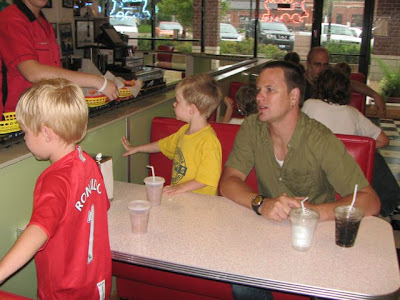 It's a burger and fries place, but the food is brought on a train. The boys loved it. Now they have a rival to their other favorite restaurant, The Choo Choo. Speaking of anniversaries ... let's just say, we are not very good at them. Or I should say, any more. The first couple years, we would go to the restaurant we went to the night Brian proposed and have a nice romantic dinner. But then we had H ... then C ... and now it's just amazing we remember it (but that's why we had the date inscribed in our rings). Last night had dinner with the boys, wrestled them to bed, and later shared an excellent bottle of wine. See what I mean? It was still nice. Anyhow, one thing I have fun with is trying to base my gift to Brian on the traditional anniversary gift suggestions. For our first anniversary (paper), I bought our wedding photo album (yes, it took that long). The second (cotton) was pajamas. And so on. Brian had been eying the Jonathan Adler Muse collection for many years. 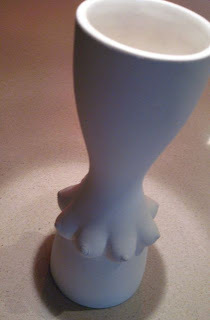 So for our 8th anniversary last year (bronze or pottery), Brian finally got a Camille Vase. I don't think this calendar would last a day in our house without all the bubbles being popped. But I still love it. Saturday was a big day. As we were headed out to watch H and his new soccer team -- the Yellow Jackets -- play their first game, Storm started going nuts and when I looked out the window, I saw why. My mom and dad surprised us with a visit. 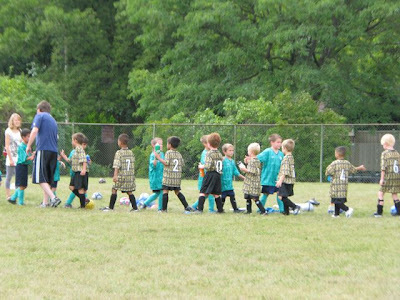 It was pretty exciting, because this was H's first real soccer game ever. He had a great time. Afterward, we made a stop at Hole in the Wall. Unfortunately, my parents couldn't stay long, but it was a really nice surprise. I think Storm was totally ticked he wasn't in the car headed back to Wisconsin with them -- where there are no kids jumping on him, or yanking various body parts, and where he gets to run free. Let's just say, I think he'd dump his real family (us) in a heartbeat for Wisconsin, the trader. Anyhow, Brian came home in the late afternoon, so we went out for sushi dinner because oh yes, I also turned 39. Brian's en route from Friedrichshafen, Germany, where he has been the past week for Eurobike. He randomly emails us photos of his journey along the way -- and here's the one from today. 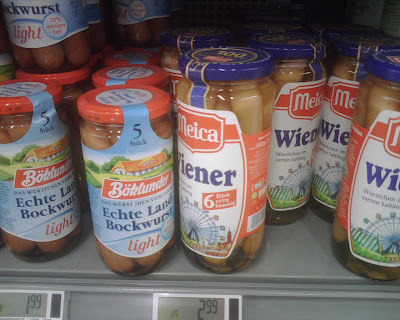 Let's just say, German grocery stores do not lack in their select of wursts and wieners (including the jar variety we just simply are not used to here). But for some reason, I still find this photo kind of funny. 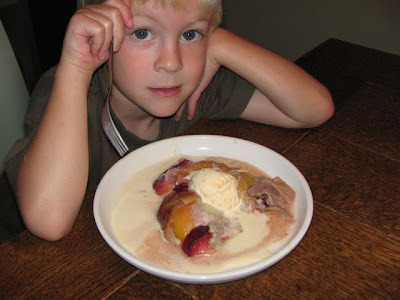 Normally, our idea of dessert is a little ice cream or popsicles for the kids. Maybe a square of chocolate for us ... or an extra glass of wine. But now, the glorious clafouti (or flognarde) has entered my life. 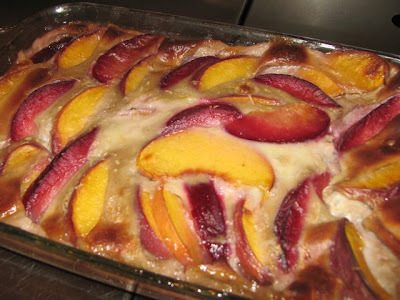 I made a simple dinner tonight -- cheese tortellini in chicken broth with zucchini and parmesan cheese -- so while the water was boiling, I whipped up a peach and plum clafouti. And when we were done, a warm, steaming, sweet smelling dessert was waiting for us. Of course, C still opted for the popsicle (because he just always has to go against the grain), but H couldn't get enough. 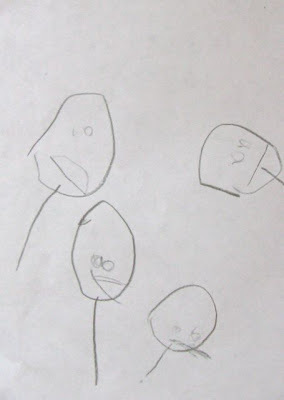 C had another big day today -- he's starting speech therapy again. Last time we went through this, it wasn't very successful. But now, after a year off, he can communicate -- it just sure would help if everyone else could understand him. Hopefully it won't be too frustrating this time around. So, bright and early this morning we showed up to his big boy school (it's another elementary school in the area). He made a little bit of a fuss leaving me, but when he didn't return after a few minutes, I figured all was fine. After 30 minutes, he came back grinning from ear-to-ear. You see, not only did he have fun, he also found a treasure! 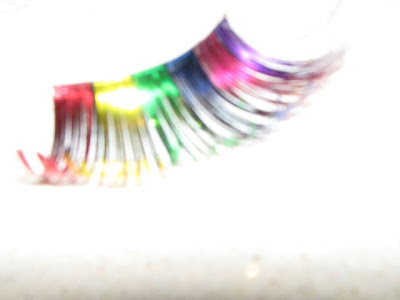 His teacher is not sure where this fabulous metallic rainbow false eyelash is from, but here it is. I promised to put it in a very safe place. Score! This will be C's second year at Montessori school ... and his first without his big brother. He would not let me get my traditional first day of school photo on our front porch, and I thought "oh, oh -- this might be a rough day." 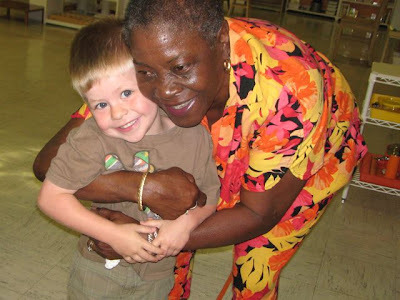 But as soon as he saw one of the child care ladies, Mrs. H., he was all smiles. I barely got a good-bye from him. And from the sound of it when I picked him up, he had a great day. 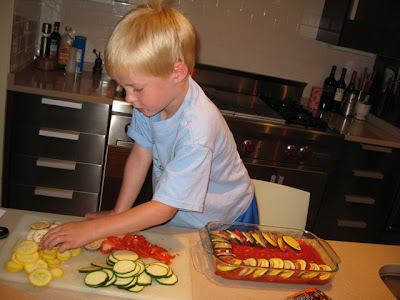 Awhile back, H requested we make Ratatouille's Ratatouille, and I actually found a great recipe for it. He's been asking for it again, so I thought a long weekend at home would be the perfect time to make it. (It doesn't take long to make, but cooks for an hour. Plus, the farmer's markets are bursting at the seams with the necessary supplies -- zucchini, yellow squash, eggplant and red pepper.) Our friend Jim, and his friend Bari who we met for the first time, stopped by for drinks, and ended up staying for H's ratatouille. It was a really nice surprise, and the ratatouille was a hit! Our Labor Day weekend was filled with friends and food. It was perfect. Sunday night was an Asian-inspired potluck at the Elsmo's, which you can read about here, and here. 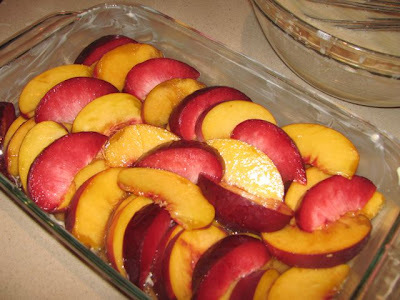 My contribution was a salad and a dessert -- I made a clafouti (recipe courtesy of Joanna), or actually flognarde since I used peaches, plums and apricots (again ... you've got to love the farmer's markets) instead of the traditional cherries. It's hard to believe summer is coming to an end.